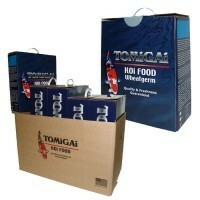 TOMiGAi - WHEAT GERM -6 lb. [Sinking Food] Pellet Size: "Medium-Large"
It is the grower line, and promotes maximum growth potential and proper development of a Kois proper conformation and size. Due to the fact that growth is best achieved when temperatures are high, TOMiGAi Wheat Germ is best used in this time of year.